And on the 72nd hole, the golf gods taketh away…. well, technically the 69th, 70th, 71st, and 72nd hole, but who’s counting? Now I will start by saying I am not the biggest Golf fanatic there is, but i follow the sport. I appreciate the history and the prestige of the game. I’m not allowed on a golf course due to my divot producing swing…. That being said, I can surely critique from the comfort of my couch. I feel bad for Adam Scott, I think he is a likable guy, seems nice and you never hear any negative press on him. Yes, there was the whole Steve Williams Caddie fiasco, but that was in no way Adam’s doing. With Tiger being seemingly out of the mix after his triple bogey, I found myself rooting for Adam. I like seeing a first time winner, i enjoyed the tears and emotion of Bubba Watson winning The Master’s this year, and was looking forward to the same today. And then, the wheels came off. Up 4 strokes with 4 holes to play, they were probably already starting to engrave Adam Scott into the Claret Jug. At some point, Adam Scott was probably feeling the same thing. “All i gotta do is play par golf, and I’m The Open Champion.” As an athlete myself I can tell you the biggest difference in a “good” athlete and a “great” athlete is the mental game. Some have it, a lot don’t. Today was the perfect example of an athlete’s mental game letting them down in the end. Adam Scott had that tournament won. Unfortunately, he couldn’t finish it. Where does he go from here? Will he bounce back and one day win the “big one”? Or will the let down of letting this one slip away linger for some time to come? Time will tell…. 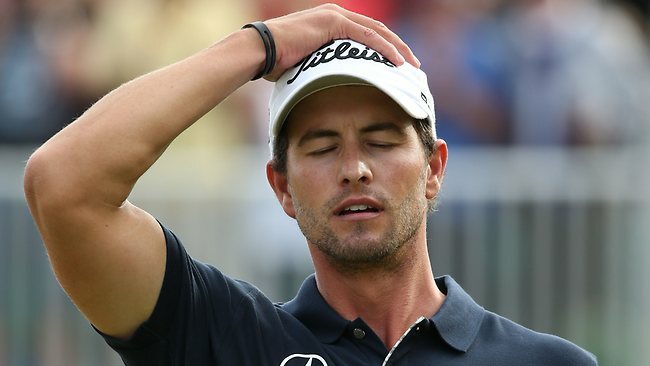 but I know this, there won’t be much sleep for Adam Scott for a few days. This entry was posted in Uncategorized and tagged Adam Scott, British Open, Claret Jug, Ernie Els, golf, PGA, The Open, tiger woods. Bookmark the permalink.